In our Catholic walk through life, I’m sure we all experience those moments of conversion that make you go “wow, Catholicism is awesome…Catholicism works!…” I have had a few major conversion moments throughout my life thus far, and this is one of them. Note: To keep things private, I have changed some names. When I was an assistant black belt instructor at my Tae Kwon Do dojo in early high school, I met a fellow Filipino family. I taught Shawn, and my family befriended his parents (since my grandfather and parents took me to class since I didn’t drive yet). Shawn’s parents are really nice, and I remember my parents and grandfather talking to them non-stop for the full hour of class…like…every time. My parents enrolled me in high school religious education classes my freshman year of high school. Needless to say, it was required so that I could get Confirmed. I barely remember my class from freshman year, but I do recall my fellow classmates from my Confirmation/religious education class. That’s where I met J.T. or at least…got to know him better, since I’m not sure if I met him my freshman year. I would say my Filipino radar is pretty good, and I could tell that he, too, is Filipino. While the Filipino connection was an obvious start to a friendship, I didn’t find out til later that J.T. is actually the older brother of Shawn. I think it was one of those awkward parent pick-up moments after class where I found this out. It kind of blew my mind, actually, because it IS a small world after all. Awesome. So now I know this family through Tae Kwon Do and Confirmation class. And my family has befriended J.T. and Shawn’s parents. Cool stuff. As the year progressed, I got to know J.T. better. Turns out he, too, is a clarinet player! We had that … Filipino Catholic clarinet guy connection, whatever that means. Since it was our sophomore year, we both went through the motions of retreats and classes for Confirmation and the actual sacrament itself. Anyway, after Confirmation…we both got involved with the our youth group. I guess the Holy Spirit truly has that power to set ablaze within souls, because we were definitely “en fuego” to be an awesome example of what it means to be a Confirmed Catholic. Our involvement continued through the summer and into the fall. We were both juniors in high school still going to religious ed class, youth group on Wednesdays, and helping out with whatever events on the weekends. But then… winter came. And that’s when it happened. Now, let me just say…the passage of time through the events described is cloudy to me since it’s been 9 years. But that’s not too important. What matters is what…happened. It was a few days after Christmas 2003. I forget through what channels that I heard the news, but I think it was some combination of emails and phone calls. J.T. had to go to the emergency room. He had been complaining of a headache that progressively got worse throughout the day, and at night it got so bad that he couldn’t sleep–he could do nothing but moan and be in pain. And I think his whole body started hurting too So his parents took him to the ER. It all happened so fast. Within a day or two, J.T. went from perfectly fine to perfectly not fine. Apparently he had come down with bacterial meningitis–the bad form of it. If my memory serves me right, he slipped into a coma. And while he was in a coma, he either suffered through a stroke or seizures or both…I can’t remember exactly. Either way, because of his bacterial meningitis, it complicated and compromised his health to the point where the doctors said he didn’t have much longer to live. I remember going on a retreat right around that time (like, the weekend after this all went down) and we concluded it with a visit to the hospital. That’s where I found out more details about J.T.’s condition and that he wasn’t really expected to live. Whoa. I might have to lose a friend in death. I wasn’t prepared for this! I can’t…lose a friend after just getting to know him…ya know? But I couldn’t even fathom how his parents must feel. Still can’t. Because…no parent desires to outlive their child. And here are J.T.’s parents having to deal with that very possibility. J.T.’s dad is a pediatrician–a kid doctor! And there was absolutely nothing he could do to help his son. Isn’t that crazy? To be trained how to help kids back to full health but not being able to help out his own son? And oh man…there was also Shawn and their sister too. They had to deal with the possibility of losing their older brother. And you know how it’s usually the mom who freaks out and gets emotional in these types of situations? J.T.’s mom, who I’ll call Susan, wasn’t like that. I remember us talking to her about about J.T. during our hospital visit. She admitted she’s been crying…but the other stuff she said still blows me away. …In addition to admitting to all her tears, she mentioned that she has complete trust in God and His will. That if He wanted to bring J.T. back home, she would be okay with that. My youth minister and his wife later pointed out that her strength in her faith and in God resembled that of the Virgin Mary at the foot of the Cross. As a young-in-the-faith Catholic at the time, I never really saw what complete trust in God and His will looked like until that hospital visit. Both J.T.’s parents, as powerless as they were in this situation, could only trust. 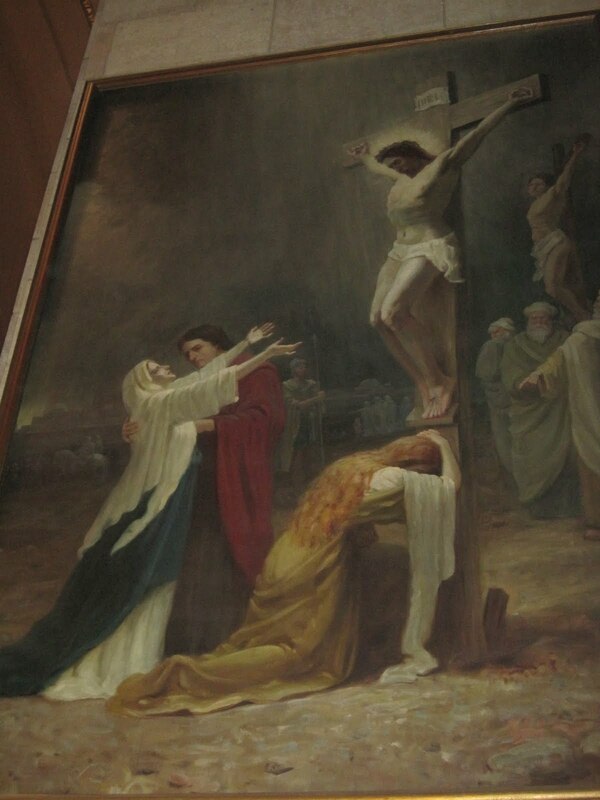 And I saw what a modern day Mary at the foot of the Cross looked like through Susan’s example. I haven’t mentioned it yet, but there were a lot of prayers offered up for J.T. from the youth group. I mean, come on…we’re Catholic. Many Rosaries and Divine Mercy Chaplets and other prayers. After our hospital visit after the retreat…I think we got together nearly every night or at least once a week to pray for J.T. As I mentioned earlier, my family is friends with J.T.’s family. I remember taking my mom with me to visit J.T. in the hospital a week or two later. By this time, J.T. survived the worst part of his ordeal but had suffered through his stroke/seizures. Because of these complications, he lost motor skills on his right side, speech and memory. Maybe other things too, but I can’t remember exactly. But he wasn’t in the clear. At that hospital visit, we found out that even if J.T. gets through all of this, he wouldn’t be 100%. I don’t recall much of how his health slowly improved in the following months after being hospitalized. I remember the youth group getting together to continue our prayers for J.T. And I don’t think I had the opportunity to go visit him in the hospital again after school started up again. I don’t remember when he finally came home. I think it was sometime during the summer. And then…I don’t remember seeing him much since that year. His life was no longer normal since he had to go through a lot of rehab and his progress was gradual…so his public appearances were minimal. J.T. didn’t get to finish out his junior year because of getting sick. I went on to graduate from high school and go to college. Throughout college, whenever I was back at home, I’d occasionally run into J.T. before or after Mass. Early on, I remember observing that his walk was very slow and his speech was labored and slow as well. And year after year running into him, I saw gradual improvement. After I graduated from college, I actually saw him a little more frequently. Consequence of living back at home, I suppose. I worked at a local rec center where apparently his family had a membership. And J.T. and his dad would stop by to exercise for rehab purposes. And then of course, I’d randomly run into him at our parish as well. To be honest, after J.T. and his family went through all that…I can’t help but tear up every time I think about it. I nearly cry because he lived through that. I nearly cry because oh my gosh…the strength of Susan’s faith is saintly to me–and the fact that his parents were totally willing to let him go should God will it. I nearly cry because every time I encounter J.T. because his good self pierces through his own personal darkness. Even if his body won’t let him be visibly joyful, you can still just…tell that he is grateful to be alive and joyful to talk with you. With J.T., I totally believe in the power of prayer. We really did pray a lot together as a youth group for J.T. and his family. I’m practically convinced that the youth group is miraculous in that sense–not because I’m saying so…but Susan herself tells me that nearly every time I run into her. She is so humbled and grateful for the youth group’s prayer and support. With today being Mother’s Day, I can’t help but think of my own mom and the other examples of pure motherhood in my life. And with Susan, seeing her son suffer like that, caused her to suffer but even in her suffering…she knew that she wasn’t in control. And for her to let go and let God the way she did helped me see a vague reflection of our Blessed Mother. Awesome. J.T.’s story provided a very real example of being Catholic. His story, to me, demonstrates that Catholicism truly works, and miracles really do happen. He wasn’t supposed to live. But he did. By the grace and mercy of God, he lived through it. And we’re all so grateful that J.T. is alive today. I’ll also bring up this example. Above, I mentioned how I worked at a local rec center where he and his family frequent. There was this one time where my supervisor and I were manning the front desk and they checked-in with us. I caught up with them for a little bit, then they went on to the gym floor. My supervisor walks over to me and tells me how amazing of a family they are, and she briefly outlined what happened to J.T. with me. She didn’t know I already knew. So I explained to her (in near tears, lol) that yeah…I’ve known the family for a long while and that I had witnessed the whole ordeal back then. She even mentioned that she gets all teary eyed about J.T.’s story and his family. Annnnd, my supervisor doesn’t even go to our church! And she knew all this just from encountering them at the rec center. Whoa. As I mentioned earlier, I still run into their family randomly at our church and other places. Because Youth 2000 was a favorite retreat of J.T.’s back in high school, both him and his parents still volunteer each year now that J.T. is strong enough. I got to see and visit with them at the Youth 2000 retreat last month. They really dig how the youth is so active and participatory in things. I recently got to speak with J.T. after Mass not too long ago. To this day, he’s still doing rehab a few times a week. He still does physical therapy and psycho-therapy. But, what’s really nice is that his speech is mostly back and he’s able to move around decently. His short-term memory has improved as well. From other recent conversations with him, I know he’s currently at TCC getting some basics out of the way. I know few years ago, he had talked about discerning the priesthood. But recently, he seems excited at pursuing becoming a doctor, specializing in some of things he’s going through right now. How awesome is that? Ever since I graduated from college and got involved with my parish again, a part of me has always wanted to get J.T. involved. I don’t think he does much with our parish now other than Mass. Praise God our current youth minister is trying to get a Young Adult group going, and I see this as a great opportunity to get J.T. involved at our parish once more. Even Susan agrees that J.T. should get involved again, but it’s been hard with all the rehab and schoolwork. Since I always run into them in passing, I never got the chance to get some contact info and J.T. hardly checks his Facebook >_>. But! Just last weekend, while in line for concessions at the movie theater, I heard someone call out my name. Lo and behold, it was Susan! In the same line! Two people behind me! So then we had an awkward catch-up moment with people between us and that was awesome. I obtained her number and email address so that I can communicate with her all the happenings. It would just be really cool to have him back and active at our parish again, especially for us old-school people. I feel like he would have sooooooooooooooooooooooooooooooooo much to offer. It’s my >>MISSION<< to bring J.T. back. Challenge accepted. Thanks for taking the time to read this wall of text. This is truly one of my real-est examples of Catholicism and a moment of conversion for sure. I hope my current parish friends (teens, parents, young adults, and others alike) get to meet them sometime. They’re an awesome family and they’re all really nice and so thankful for God in their lives. Please continue to pray for J.T. and and his family…because they still pray for us in youth ministry! I don’t get to see J.T. that often since he still does some rehab and also works. But, I did run into him and his mom at our parish fish fry during Lent. I think the biggest development recently is the return or maturation of his mental capacity to be where it needs to be because apparently he’s always struggled with that since falling sick. Next Next post: Know kneelers, know comfort. No kneelers, no comfort.